There are ceiling fans but no air-conditioning. This is fine for either early morning or late evening classes. The Palapa Suuk Yoga Studio reception is closed for the 7.30am weekday or 9am Saturday Kundalini Yoga classes; entry is via the black door to the right of the reception. 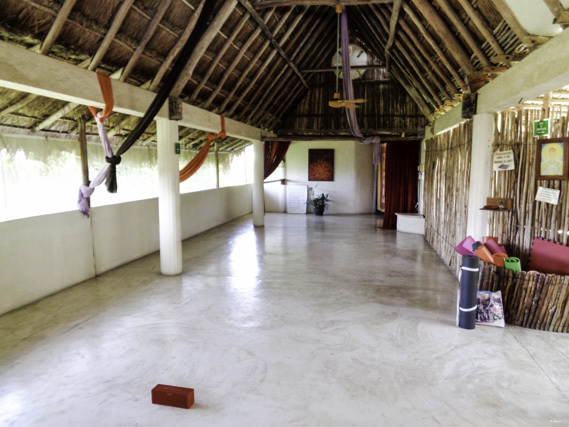 There are some Yoga mats and blocks available at Palapa Suuk. I’d recommend bringing a Yoga mat or a towel to put over their Yoga mat. I attended my first Kundalini Yoga class at Palapa Suuk Yoga Studio and it was a great experience. A very simple definition of Kundalini Yoga is that it’s a blend of physical and spiritual – it incorporates movement, pranayama and chanting mantras. Palapa Suuk has four Kundalini Yoga classes per week and I attended the Saturday morning Yoga class with Yoga Teacher Caroline. Caroline discussed with me what Kundalini Yoga is prior to the class starting and helped to guide me through the Yoga class. I’d recommend getting there early to get a position in the front row – it’s easier to see exactly what the Yoga Teacher is doing and they can assist students in the front row with ease if required. Caroline queued the Kundalini Yoga class in both English and Spanish but it was mostly in Spanish – it was pretty easy to follow along. Caroline was very warm and welcoming and just had a gorgeous energy about her – she clearly was passionate about Kundalini Yoga and that made the class really enjoyable. There is lots of pranayama (breathing exercises) and chanting mantras in this Kundalini Yoga class. Caroline had the mantras written on white boards at the front of the studio and hands out little cards with the mantra written down – so no need to worry about not knowing the mantra. The majority of the Yoga class was seated so it’s not a physically demanding Yoga class. The eyes are closed throughout a lot of the class – with one eye half-open to follow along with the mantra from the board or paper. It’s very different from any other Yoga classes I’ve attended; these are usually either Hatha or Vinyasa style Yoga classes. At first it’s a little confronting but accepting and being open to the Kundalini Yoga experience is crucial for getting the most out of the Yoga class. It was also great to attend a Yoga class that focused on mantras and Pranayama – whereas in many other Yoga classes the main focus in on the Asanas (poses) with little for no time for mantra or Pranayama. After the Yoga class Caroline made a special effort to explain, in English, exactly what the mantras meant and why we chanted them and how the Pranayama’s should affect the body and mind. I really enjoyed my first Kundalini Yoga class. I’d recommend it other Yoga students who would enjoy bringing their awareness and focus inward and are open to their spiritual side and not be shy about chanting mantras – just read along at first and you soon be chanting along with your eyes closed! I felt great afterwards and think I felt the Kundalini rising! Cannot wait for my second Kundalini Yoga class.